If you’re anything like me, you probably hate ads on the internet. I know they are a necessary evil, since they pay for all the free content and services we enjoy, but I think there’s a right way and a wrong way to employ them. As you’ve probably noticed there are ads and affiliate links on this site, so I’m going to take a moment to explain our stance on them. 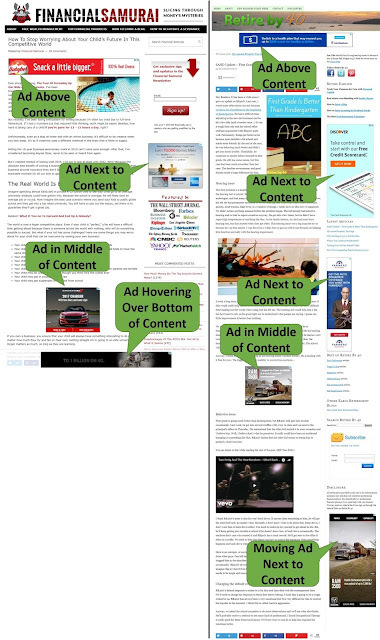 Nobody likes seeing large, graphic banner ads, especially above and in the middle of the content they're reading. To me, the presence of these ads indicates the website owner cares more about their advertisers/revenue than their content or their reader. I’ve noticed these annoying ads are in heavy rotation on a lot of personal finance blogs, but you won't find them here. You won't find ads like this on our site. We do this because we respect our site and we respect our readers. We may be giving up quite a bit of potential revenue, but we’re OK with that it if means we can have a more pleasant website and our dignity. We also realize you could easily install an ad blocker (which roughly a quarter of internet users have already done), reducing ad revenue to zero. So if you are using ad blocking software, please disable it on our site. You will find the experience very similar with and without ads, and we will get a few pennies to help balance our budget. *This applies to the desktop version of the site. I hope it applies to the mobile version as well, but it is automatically generated and Google may throw ads in odd places. Affiliate links are the primary revenue generation mechanism we employ on this site. They can get get pretty questionable, but when used honestly and with discretion, I think they are the best form of online advertising. Affiliate links allow us to basically endorse a product and get a small commission when our readers use that product, which seems pretty fair. That being said, we pledge to only post affiliate links to products and services we really believe in and, in almost every case, use ourselves. We will do our best to make it clear which links are for affiliates, but it’s safe to assume any product or service we link to will be an affiliate link if it’s available. It seems like sponsored posts are happening more and more often and the disclaimers are getting smaller and smaller. We have been approached multiple times to post sponsored content and we have declined every time. We are not totally opposed to sponsored posts, but they have to be right. We pledge to make it very clear if/when we decide to post sponsored content, and we will only do so if we actually believe in the product or service being promoted. We hate ads just as much as you, but we, and the rest of the internet, depend on them for revenue, so please understand we are doing our best to make them unobtrusive and we have very high ethical standards when it comes to advertising. Our integrity is worth more than any amount of advertising revenue and we will always put our readers’ interests ahead of our advertisers. Since we're on the topic of annoying things on websites, I also pledge not to have annoying pop-ups requesting you sign up for our mailing list. So there.